You're participating in a multiple deck game (the specific rules variations are unimportant). You're dealt an eight and a five for a two card total of 13 which you must play against the seven the dealer is showing. It's a hitting/standing decision here. Which one is it going to be? Well, the correct play is to hit this hand. The "no bust" attitude (meaning you don't take a hit and therefore make sure you don't bust out) is not going to work here. When the dealer has a seven as his upcard, he's going to bust out only about 26% of the time. That leaves you with a losing hand on the rest. With your 13, of course, you're only going to bust on the first hit if you draw a nine or ten value card. Our knowledge of the deck, based on the data we have before us, and without counting cards, indicates that the nines and tens add up to 20 cards in the deck. Three cards are gone (your eight and five and the dealer's seven), so there are 29 cards with which you will not bust. 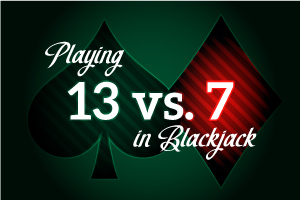 By hitting the 13 here, not only does your WINNING percentage go up 7 percent, your LOSING percentage decreases 14%! It really does make sense to hit your "stiff" hands against dealer's "pat" upcards, because in situations where you are a percentage loser you can actually have a chance to salvage something out of it; to preserve some of your playing bankroll. This play is a huge gain over the alternative. Do it without hesitation! !